Worked area is approximately 5 by 7 inches and I choose a kit with linen color fabric. I used the weight and colors she suggested for the Ed Mar rayon. 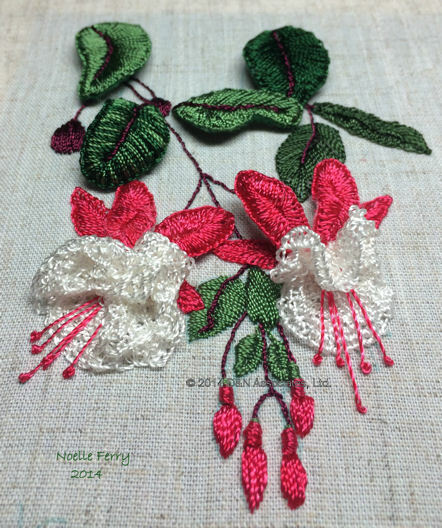 The fuchsia petals are worked in needlelace. For the needlelace I found the Ed Mar rayon thread a bit of a pain to handle. I plan to try the needlelace area of a sweatpea design that I purchased from Ms. Holzberger using a size 12 perle cotton thread instead of the rayon. This is the first time I couched wire onto a separate piece of fabric, stitched the petals and leaves, then snipped away extra fabric. Following Ms. Holzberger instructions I found this to be an easy process to follow.